Chiffon cake is a wonderfully light and moist dessert that can be made in practically any flavor you can imagine! A chiffon cake may remind you of an angel food cake in appearance but this chiffon cake is rich and buttery whereas angel food has no fat. 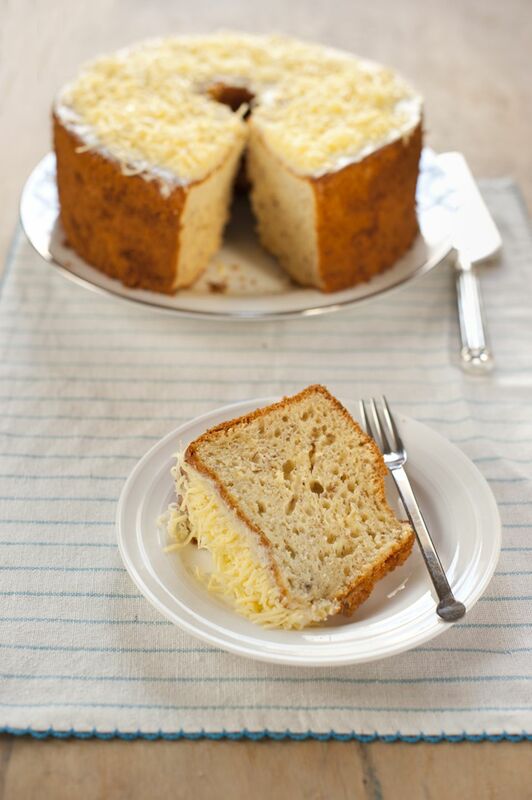 This fool-proof recipe for Banana Chiffon Cake has amazing flavor and excellent texture. The coconut frosting is quick to prepare and really goes well with this cake. This cake is perfect for a dinner party or family dinner. In a large bowl or the bowl of a stand mixer, combine the flour, sugar, baking powder and salt. In another bowl, whisk together the egg yolks, oil, water and vanilla. Add wet ingredients and mashed banana to dry ingredients. Blend with mixer until smooth, about 2 minutes. Using another clean, dry bowl and clean, dry whisk attachment , whip egg whites on medium speed until stiff peaks form (peaks will remain straight when you hold the whisk horizontal). Gently stir in 1/3 of the egg whites into the yolk mixture. Gently fold in the remaining 2/3 egg whites (don't over mix, it's acceptable to have white streaks). Gently spoon batter into an ungreased 10-in. tube pan. Run a butter knife through batter to remove air pockets. Bake on lowest rack for 60-65 minutes or until top springs back when lightly touched. Remove from oven and immediately invert baking pan onto a wire rack (leave in pan). Allow cake to cool completely. Run a knife around sides and center tube of pan. Invert cake onto cake plate. Frost just the top of the cake with the 7-Minute Frosting (recipe below). Combine all ingredients except vanilla in the top of double boiler or a large metal bowl. Place double boiler over medium low heat or place metal bowl over a pot of simmering water. Beat with an electric hand mixer until icing is fluffy and stiff peaks form when beaters are removed, about 5-6 minutes. Remove from heat and stir in vanilla and 1/2 of the coconut. Sprinkle remaining coconut evenly over top of cake.